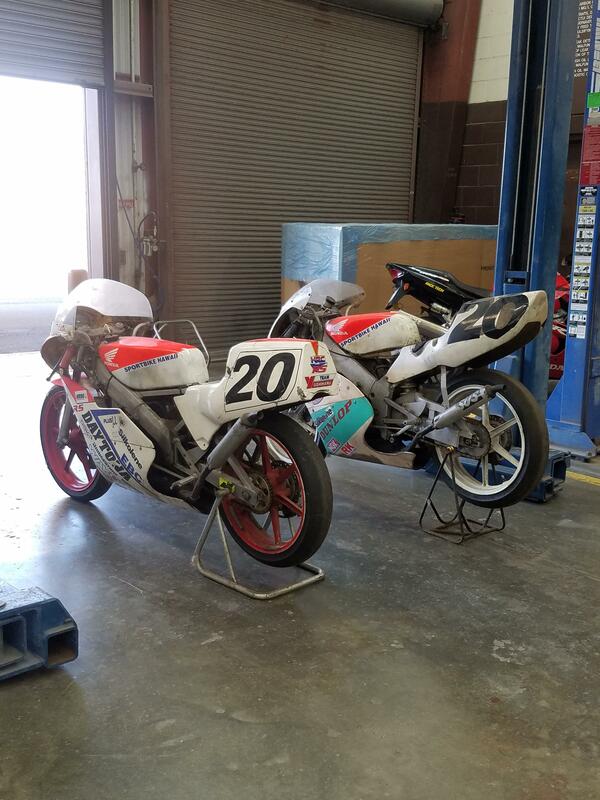 NSR250 Forums - View topic - Some new project bikes! Just picked up these 2 beauties. Both will need full resto as they have been languishing for over a decade in a shop. The 95 model is actually the last bike I raced in Hawaii. I decimated the 600 Supersport riders at the time, winning the Formula 3 championship. Grab all the spares you can for the 93 NF4 as Honda don't make anything any more, there is still a fair bit of NOS stuff about that pops up on E bay from time to time, also a company in Germany called dhs services making and supplying bit,s from piston kits to some body parts, they sell on E bay as well, I have bought a few bits off them with no hassles. My son also won a champion ship in 97 on his 95 one. Don't know if you have rode the earlier model, but they are so different to the later ones, so much harsher and rougher, no balance shaft like the 95 on model, more cruder suspension and of course no cassette gearbox. I have been lucky to have amassed a lot of new spares over the years, ie crank, barrel, head, pistons, rings and gaskets, a few RS250 NF5 bits, ie pistons kits and cyl head O rings fit the NF4. Good luck with the rebuilds, and keep us posted on progtess. Lesviffer750 wrote: Grab all the spares you can for the 93 NF4 as Honda don't make anything any more, there is still a fair bit of NOS stuff about that pops up on E bay from time to time, also a company in Germany called dhs services making and supplying bit,s from piston kits to some body parts, they sell on E bay as well, I have bought a few bits off them with no hassles. My son also won a champion ship in 97 on his 95 one. Don't know if you have rode the earlier model, but they are so different to the later ones, so much harsher and rougher, no balance shaft like the 95 on model, more cruder suspension and of course no cassette gearbox. I have been lucky to have amassed a lot of new spares over the years, ie crank, barrel, head, pistons, rings and gaskets, a few RS250 NF5 bits, ie pistons kits and cyl head O rings fit the NF4. Good luck with the rebuilds, and keep us posted on progtess. Yeah, I'm really trying to finish a bunch of 4 stroke stuff and get them out so I can focus on these bikes. I'm fortunate that in this day I can easily find help with them. I've been in contact with a couple of great tuners in California. 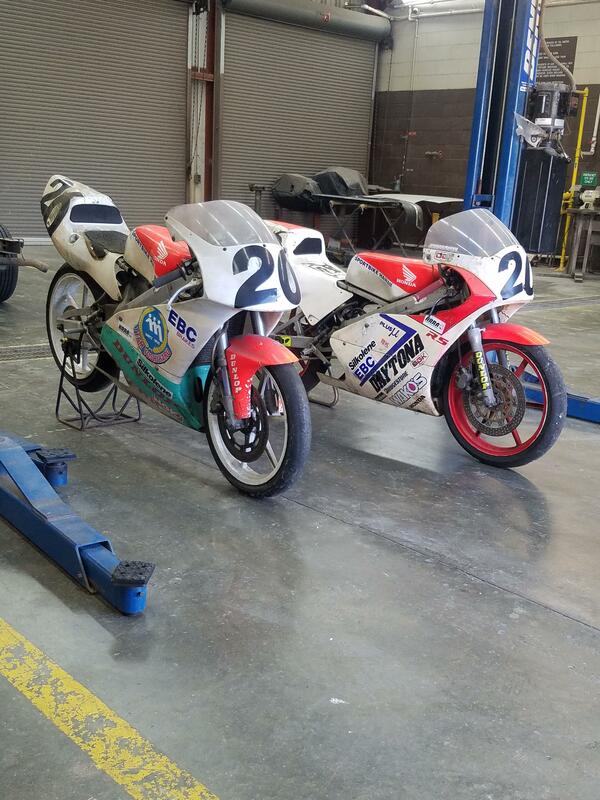 These 2 and my NX5 RS250 will be going there for me to race eventually. You got an RS250 as well, a man after my own heart, cant beat having a few real race bikes in the locker.